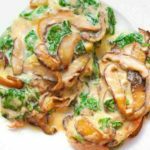 Creamy Spinach and Mushroom Chicken - What's In The Pan? Easy Chicken Breasts is quick and easy recipe to add to your chicken dinner rotation! 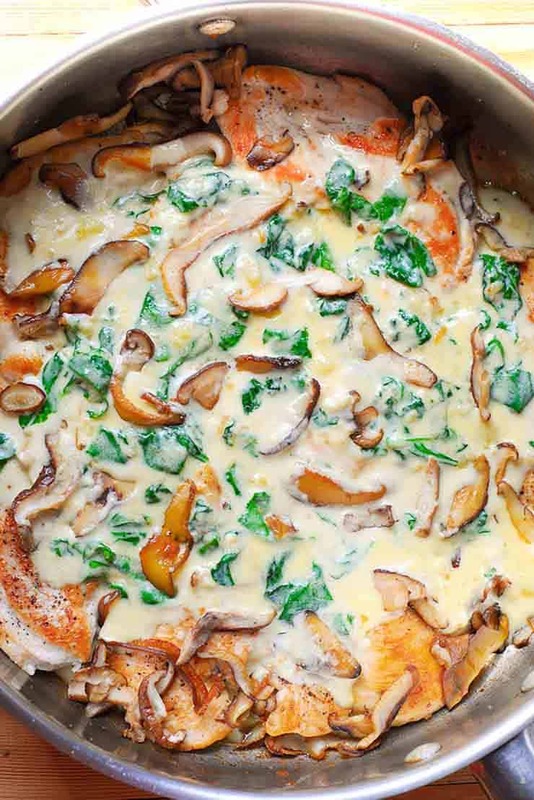 Add spinach and mushrooms and there you have quick and easy weeknight dinner! These chicken breasts are super juicy and tender. It will become a new family favorite! 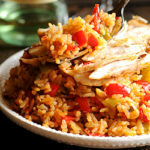 To make easy chicken breasts you will need buy a family pack of 4 thick chicken breasts. Then you would halve each one crosswise. As a result, you will get 8 regular portions. I did the same thing in Pan Fried Chicken and Parmesan Crusted Chicken. With the edge of a knife parallel to the cutting board, carefully slice the breast in half width-wise. As a result, top and the bottom cuts should have approximately the same thickness. Not only will it make chicken cook more evenly, but also faster. I make Easy Chicken Breasts with Spinach and Mushrooms quite often. And the chicken always comes out perfectly. It’s never dry or overcooked. Do you want to have tender and moist chicken breasts every time? And in an amazingly delicious and cheesy sauce? Then this is THE recipe! You will witness an amazing transformation of the otherwise boring chicken and spinach dish! 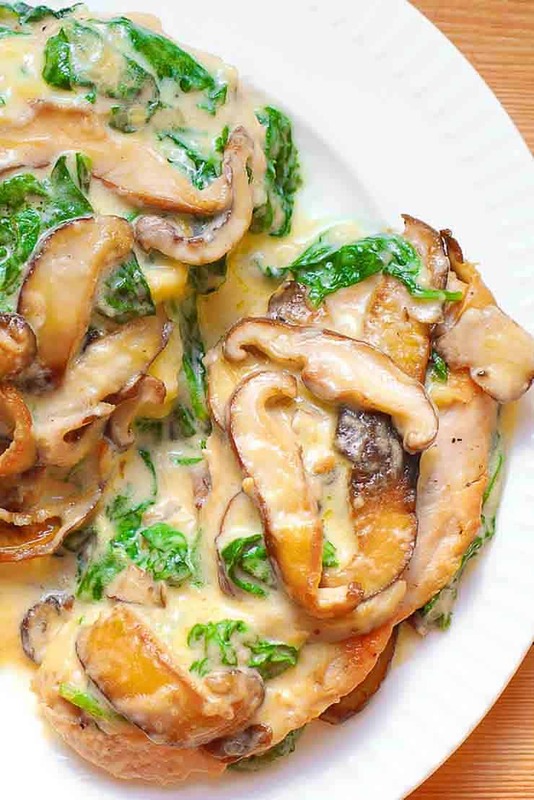 Cremini mushrooms in this chicken mushroom spinach combination taste amazing! They are simply the brown version of the common white cultivated mushroom. You can also think of them as older than the white mushroom. The smaller, white button mushroom is the youngest variety. While the larger, portobello mushrooms are the oldest. The cremini fall in between. First, you will need to brown chicken. You will need to use either vegetable oil or butter. I used olive oil here, but any other vegetable oil or butter will be great was well. You will cook the chicken for 4-5 minutes on each side. For a total of 8-10 minutes. Once you cook the chicken, remove it from the skillet. After you cook the mushrooms, remove them from the skillet and start making the sauce. First, add butter to the hot pan. Once you melt the butter, add garlic. Cook it only for a couple of minutes until slightly browned and fragrant. Next add flour and stir it well into the butter and garlic mixture. After you stir flour, add chicken broth, heavy cream and Parmesan cheese. Allow them to blend on low heat for a couple more minutes. Season with salt, pepper and garlic powder. Taste the sauce and see if you like the level of seasoning there. Next add spinach and allow it to wilt. Finally, add chicken and mushrooms back into the pan. Reheat for about 2 minutes. And this is how Easy Chicken Breasts with Spinach and Mushrooms it done! That’s it! It’s that simple! Yet, how amazing does it look? Make sure to heat the stainless steel pan before adding the oil. Then add the food. Steel expands when hot and contracts when it comes into contact with a cooler temperature. That’s why foods stick to the surface if the surface is cold. By adding oil to the pan when it’s hot, the steel becomes static, resulting in a temporarily nonstick surface! Leave me a comment if you have additional questions. I’m happy to answer them! 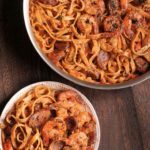 Be sure to follow along on PINTEREST or FACEBOOK to get more recipe ideas! 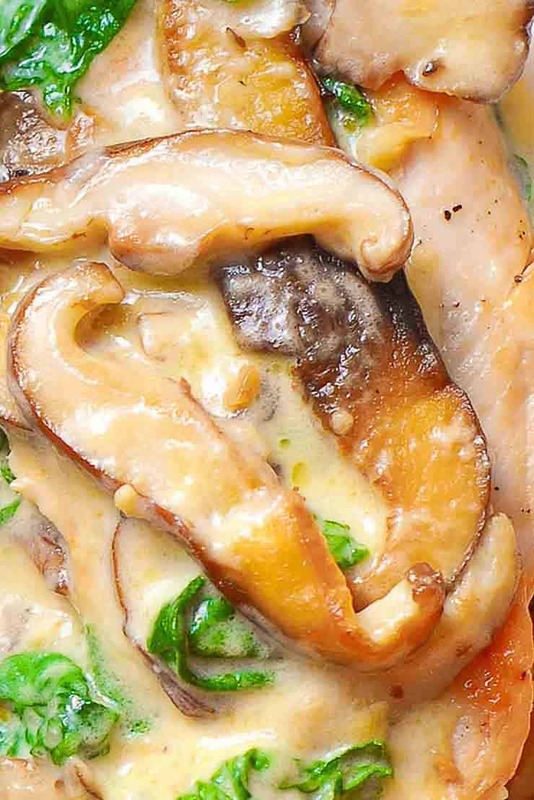 Chicken with Spinach and Mushrooms is a wonderful dish to make for the company coming over! Now add the sliced mushrooms and remaining tablespoon of olive oil to the pan. Sauce for 5 minutes, your mushrooms should look nice and moist, and dark. Once cooked, remove them from the pan. 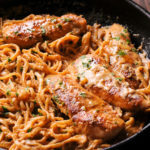 Sauce: To make the sauce, add butter to the pan, allow it to melt and then cook garlic in it until slightly browned – only for a couple of minutes. Add 1 tablespoon flour and cook until it's no longer raw. Slowly add chicken broth, heavy cream. Once simmering add Parmesan cheese and allow it to blend for 2-3 minutes. Add salt, garlic powder and pepper. Taste the sauce and adjust the seasoning, if necessary. Add spinach to the sauce and allow it to wilt. Next cooked mushrooms back into the pan and mix them into the sauce. Now add cooked chicken and allow it to reheat for 2-3 minutes. Close the lid to help the heat stay in. Serve immediately! Spoon sauce all over chicken. I made this recipe but used thighs because that’s what I had, and I think it was delicious! I also crisped up some prosciutto and threw that in – yum!!! That’s so great Mary. I’m glad you liked them! I LOVE this! and My sons do, too! My 11 year old said to make this every time I make chicken! I used pepper jack cheese, and it was a great substitute! Thanks you! Reduce calories (and fat) by swapping out the cream with nonfat Greek yogurt. This adds a nice tang, too. Nice – I like that idea. I would really like to see recipes calling for chicken breasts use weight. The boneless breast halves I buy from my local supermarket have been growing in size over the past years, and are now usually close to a pound, so @4 lbs of chicken seems excessive even for 8 servings, unless feeding teens. I do slice them lengthwise into cutlets, usually 3 per half breast, that end up being 5-6 oz each, with one being plenty for a single serving. Observations–you suggest cremini mushrooms, but the photo shows shitake; for most of the US prepackaged white and cremini mushrooms are in 8 oz containers, specialty mushrooms in about 3-3.5 oz. packages. The recipe was easy and absolutely delicious, and I gave it 5 stars despite the flaws. I used an 8 oz package of crimini, plus 3 oz of fresh shitake, 3 chicken breasts at nearly 4 lbs, 2 oz of baby spinach (considerably more than 1 c., but when cooked apparently not much more than the photo indicates). I also added a couple of tablespoons of sherry to the sauce along with the chicken broth because it does such a good job of accentuating mushrooms, but it was sort of gilding the lily. If you are going to use wine, you need to add it early enough so the alcohol completely cooks out and doesn’t spoil the flavor. There were 7 of us at table, and leftovers. What do you recommend I serve this with? Because Brussels sprouts are in season, I use this one https://juliasalbum.com/maple-butternut-squash-roasted-brussels-sprouts-pumpkin-seeds-and-cranberries/. 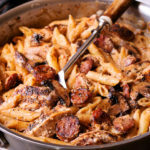 But usually I serve it with garlicky mashed potatoes https://whatsinthepan.com/instant-pot-cheesy-garlic-mashed-potatoes/. Do you think I could use steak in this instead of chicken? You certainly can. It’s a pretty quick recipe – the steak won’t have enough time to get overcooked.